As announced, Apple has begun selling the white iPhone 4 in Eastern Hemisphere and European countries as those markets roll around to April 28th. The U.S. and Canada should follow suit in just a few hours as clocks tick over to the new day. While the company is advertising availability on the front pages of its sites in countries where the clock has past midnight, online orders do not yet appear to be available, although third-party retail outlets appear to be free to open their doors. Even prior to the official release, the white iPhone 4 was making its way into the hands of select customers as certain retail stores initiated early sales of the device. Steve Jobs and Phil Schiller also conducted a telephone interview with All Things Digital earlier today in which they touched on some of the challenges the company faced in bringing the white iPhone 4 market a full ten months behind schedule. 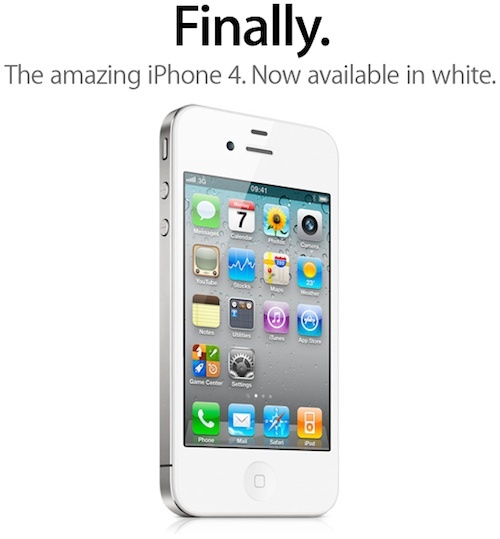 Update: Video of the white iPhone 4 officially going on sale in Hong Kong. Does anybody notice that these threads about the White iPhone go the same way each and every time? 3) Is anybody really going to buy these things? "Finally. Apple's last chance of milking the iPhone 4 until the iPhone 5 comes out". I'm more interested on what's to come in a few months! Hmm... I think I'll still wait for the 5th gen iPhone since I've already held off on the iPhone 4 for this long. Woulda gotten the iPhone 4 if the white one came out alongside the black iPhone 4. Wait. You mean idiots, I mean people, actually waited just so they could buy the gadget in white? What would you do if there was no iPhone 5, like apple just decided this was going to be it. I mean, they have to stop somewhere. And secondly, you might like white cause when the white iPad 2 I thought I was going to hate it, but I saw it in person on Monday and I kind of actually like the white iPad 2 better than the black one. Idk, might just be personal opinion. There will be. Apple is a hardware and software company, so every revision contains software (iOS 5) and new hardware (iPhone 5). Even if Apple does stick with the iPhone 4 design just like the MacBook Pros, they have to launch internal upgrades. But the smartphone market is changing too fast for that. A lot of rumors point to a better antenna and a larger screen, so here's hoping for those. Yeah it's a person opinion. I think it looks tacky and almost looks yellow when dirty. I prefer the black.